As you are likely aware, I have written about many Cabernet Sauvignon’s in my blog over the years. To me, like most, Cabernet is the King of wines. I do however, feel there are many varieties that can compete with this King of wines. Of the top varieties on my list is the Nebbiolo varietal from Piedmont. I also think the varietal Malbec from Argentina is a strong runner and as I continue to try to explore other wines, I believe I’ll find more. To be honest, I have little experience with wines from Germany, Australia, New Zealand or South Africa. Each of these countries are considered New World wines. I plan to reach out and try some Rieslings and Pinotage wines. So…. If you have a favorite please suggest them to me so that I can evaluate them myself for a future review! You maybe asking what is a New World wine? Well the a New Worlds wine does not have any real history. The wine making methods are usually brought in from another country like France for example. The first wine brought into the US was called the Mission grape. It was brought in by missionaries during the 1700’s. The Mission grapes history comes from South America. I was wandering through me cellars trying to look for a “CAB” from a winery that I had not blogged. I came across one from Tamber Bey in the Yountville AVA. I have not had too many Yountville AVA Cabs, so I was looking forward to trying it. A deep color depth and purple hue. The aromatics were moderate. The development was young fruity while I noted black pepper, dark fruit and oak with the black pepper dominant. 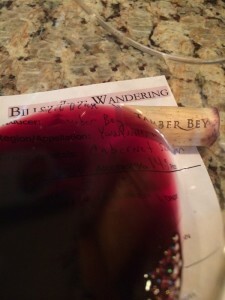 This Cabernet was dry and full-bodied with a lively acidity level. The tannins were medium with a dry, astringent mouth feel. It was flavorful with a soft silky mouth feel and I believe was made to pair with food because the finish was really short. How much? $55, if you look on-line it is $45.00. 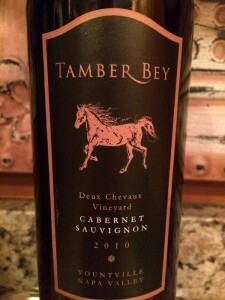 I rated the 2010 Tamber Bey Deaux Chevaux Cabernet Sauvignon two glasses. I felt the finish was too short with a peppery nose and taste is not what you want for a wine that you’ve paid $55. Rather, it should be soft, silky, and velvety.